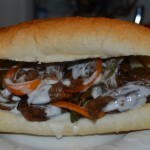 It doesn't get much better than a Philly Cheesesteak when it comes to comfort food! Checkout our adaptation that you can whip up at home for lunch or dinner! Place beef in freezer for 15 minutes. Cut beef across the grain into thin slices. Sprinkle beef with salt and pepper. Remove brown gills from the undersides of mushroom caps using a spoon; discard gills. Remove stems; discard. Thinly slice mushroom caps; cut slices in half crosswise. Heat a large skillet over medium-high heat. Add 1 teaspoon oil to pan; swirl to coat. 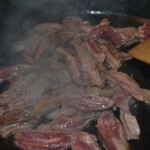 Add beef to pan; sauté 2 minutes stirring constantly. Remove beef from pan. Add remaining 1 teaspoon oil to pan. Add onion; sauté 3 minutes. 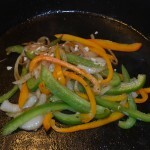 Add bell peppers, and garlic; sauté 6 minutes. 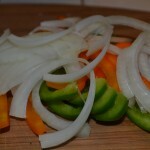 Return beef to pan; sauté 1 minute or until heted through and vegetables are tender. Remove from heat. Stir in Worcestershire and soy sauce; keep warm. 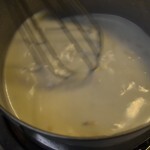 Place flour in a small saucepan; gradually add milk, stirring with a whisk until blended. Bring to a simmer over medium heat; cook 1 minute or until slightly thickened. Remove from heat. Add cheeses, stirring until smooth. Keep warm and stir frequently to keep the sauce smooth. Hollow out each half of the rolls, leaving a 1/2-inch-thick shell.. Divide the beef mixture evenly among bottom halves of hoagies. Drizzle sauce evenly over beef mixture; add the top half back on and serve.